Project Addition of 2 HOV lanes to existing 10-lane freeway. 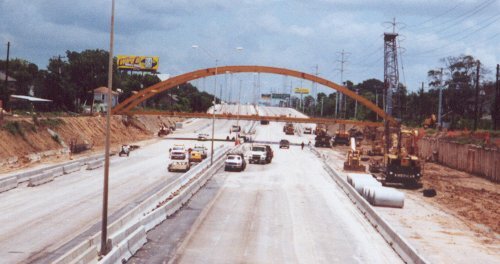 This improvement project has added the distinctive long-span arched bridges over the trench. The spans are approximately 217 feet (66m) long. The project will add 2 HOV lanes, but will not add any general purpose lanes to the existing 10 lanes. This project is a prelude to the bigger and potentially hugely disruptive next phase: demolishing the adjacent elevated freeway and placing the freeway in a trench. That project could begin in 2002. 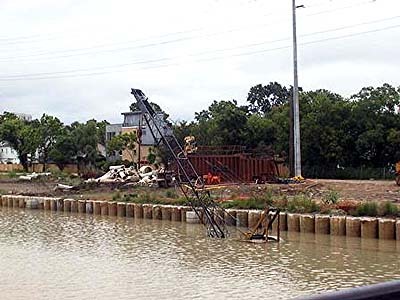 Massive flooding in Houston in June 2001 filled the US 59 trench, nearly to the very top. Photo credited to Robert Cowart via the Houston Chronicle. The contractor for this project, Williams Brothers, reportedly suffered heavy equipment loss. Photo contributed by Don "The Emissary" Seributra. A view of the flooded trench. 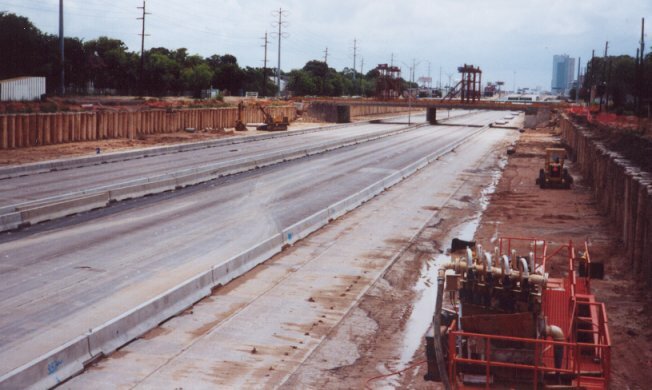 Looking west, this is the freeway trench in June 2000 during a closure for bridge demolition. 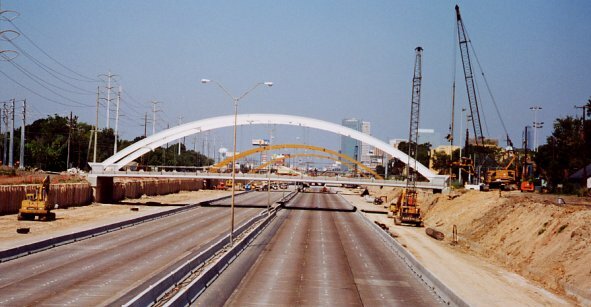 Four existing bridges were replaced with single-span arched bridges. One of the old bridges is shown in this photo. 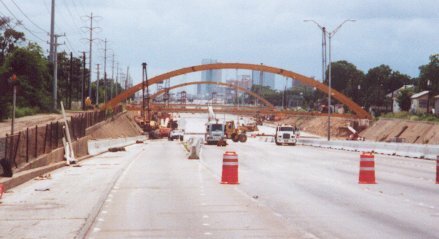 As of June 2000, two arched bridges were in place. There are a total of four in this project. This view is towards the west. 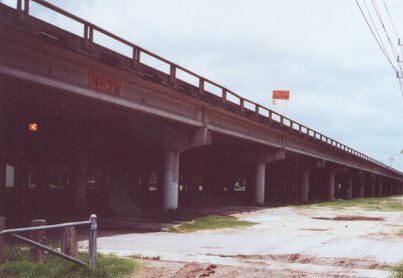 This is the existing 10 lane elevated freeway that will demolished and placed in a trench. Tentative project letting is 2002 for this $58 million project.